I had the opportunity this week to host a CXPA round table on Best Practices on Customer Journey Mapping for B2B and B2C. We had great participation from a number of companies, including Fidelity, Thomson Reuters, and ServiceNow. A research activity where you work with customers to understand the steps they take as they experience your journey, and the emotional impact of each step along the way. I wrote a white paper on the topic here. A workshop where you bring members together to lay out the customer journey, often involving the people and systems that impact that customer journey. These workshops are also called Customer Ecosystem Map workshops, and I put together a SlideShare on the topic here. 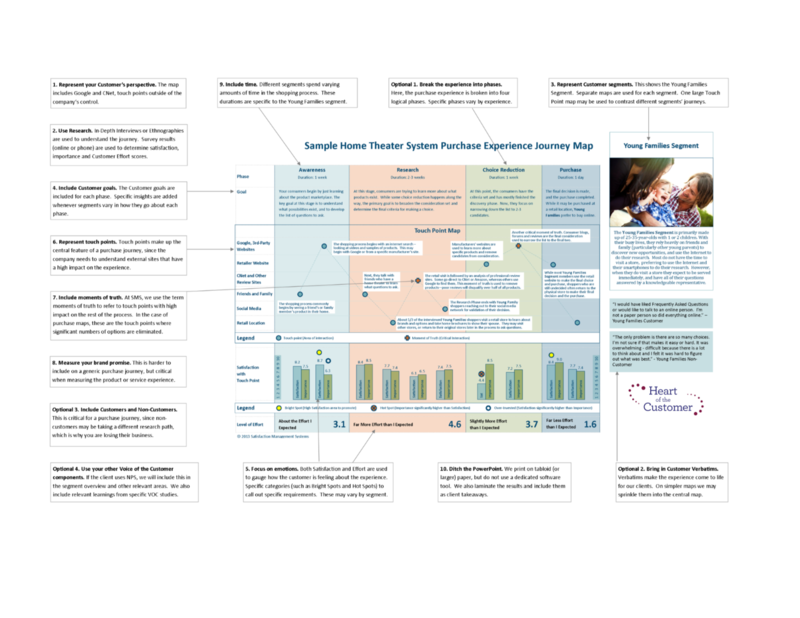 Customer Ecosystem Maps are the inside-out complements to Customer Journey Maps. These maps are created by internal teams, and document the actions, people and systems that enable the customer experience. They are a great way to bring teams together to create a shared view on friction points, and to create alignment on what needs to be solved. I recently trained a company’s customer experience teams on this process. This becomes a great way to get departments to work together, and I am excited to see their results. Rather than trying to communicate it through text, I have created a Slideshare to walk through the steps. It is best viewed in full-screen, as the maps get somewhat complex. Enjoy, and let me know your experience with this process! Have you had a great customer experience? One you really enjoyed – a flawless purchase of a car, a fantastic trip, or a great B2B partnership? Now think of the opposite – a cell phone provider who frustrated you, a business partnership gone sour. What made the difference was not an individual touch point, such as a call center or website. Instead, it was the overall journey – the process of purchasing the car went well, or the upgrade to a new phone caused far more trouble than it was worth. Individual touch points contribute to the experience, but it is the accumulation that matters. Your customer experience is a journey. But too often, we manage it like a series of touch points, without looking at how these touch points fit together. And herein lies our customer experience challenge. It is easy to measure website satisfaction or the customer service skills of a call center rep. We do this regularly. But what if your customer looks at your website for information, can’t find it, then calls your rep? How do you measure this entire interaction? The rep may do a fabulous job of handling the complaint, but the journey was a failure. For you Slideshare fans, I have uploaded a presentation on creating a customer-focused Customer Experience Journey Map. Customer journey maps go by different names, such as customer experience maps, journey maps, and touch point maps. 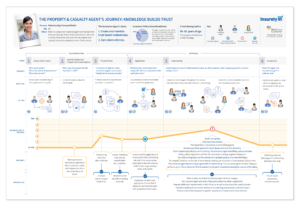 Journey maps serve as a visual means to identify the steps your customer goes through as they experience your product or service and the impact of each. Customer journey maps chart your customer’s experience and help you target improvements with the greatest return. By identifying those steps in the customer experience with the greatest impact, your journey map becomes a centerpiece of your customer experience planning process. A customer-focused customer experience journey map is a crucial first step to designing and improving your customer experience. How do you go about creating such a document? The attached white paper walks through 10 required and 4 optional principles for creating such a map. It also includes two examples of how I create maps at Heart of the Customer, although you could use the principles to create maps that look entirely different. Maps represent your Customer’s perspective. Include your Customer time progression. Download the white paper today and create a great customer journey map tomorrow! 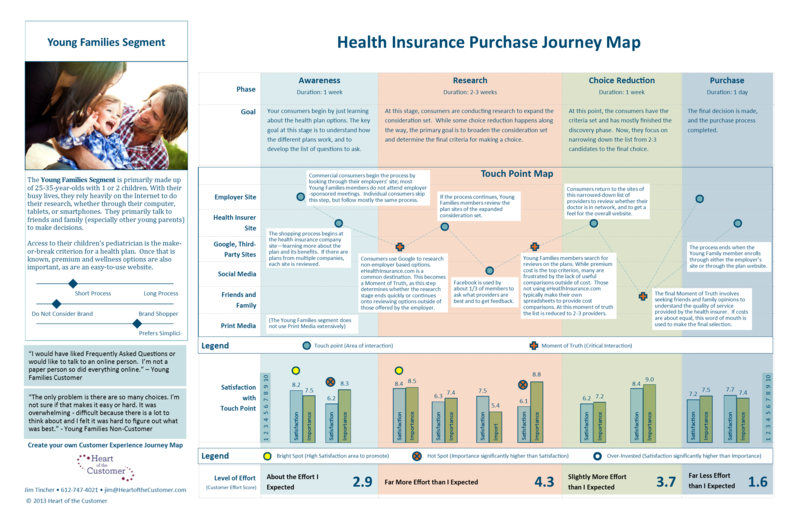 A customer journey map is a critical tool to understand your customer experience. 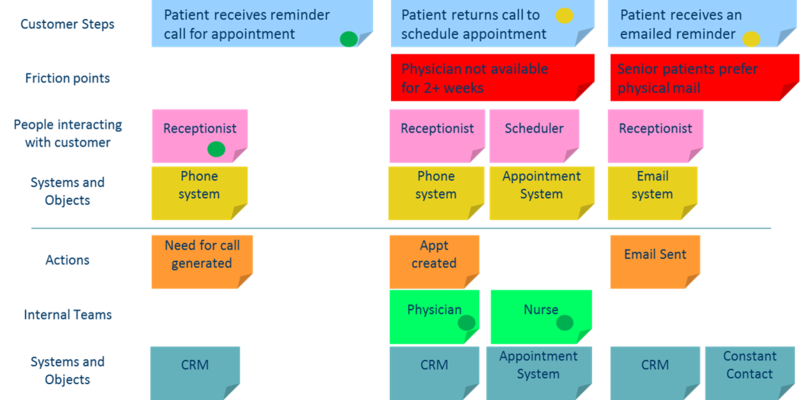 A journey map can help you understand a long-term engagement, such as when a prospect shops for your category, or to find opportunities to improve a specific experience, such as when a customer calls for service. Last week’s post Customer Experience Journey Map – the Top 10 Requirements generated a ton of great dialog through Twitter, LinkedIn, email and even a few phone calls. 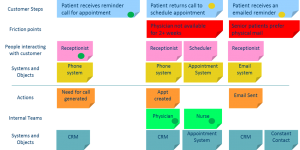 To help continue this dialog, this post includes two example customer journey maps that we use with our clients at Heart of the Customer. Please keep in mind that these are simply our implementations of the journey map criteria. As a Customer Experience advocate and researcher, I make no pretensions to graphic design skills! But this may help you apply the criteria to your own customer experience. You can also download a PDF of the two maps at the end of this post. It’s been two years since I originally wrote this post. See the update here. A customer journey map is an incredibly useful tool to understand and improve your customer experience. A great customer journey map documents your customer experience from your customer’s eyes, helping you to understand not only how customers interact with you today, but also identifies improvement opportunities. Unfortunately, there is no standard for a customer journey map. You can build it following high-quality design principles, or use smiley faces. You can make it a work of art, or something that looks like it belongs on a napkin. I have included an example on the right, as well as some useful links at the end of this post for those unfamiliar with a customer experience journey map. The customer journey map may go by a different name, such as customer experience map, journey map, touch point map, etc. The map provides a visual representation of how your customer uses your product or services, or how potential customers go through the shopping process.